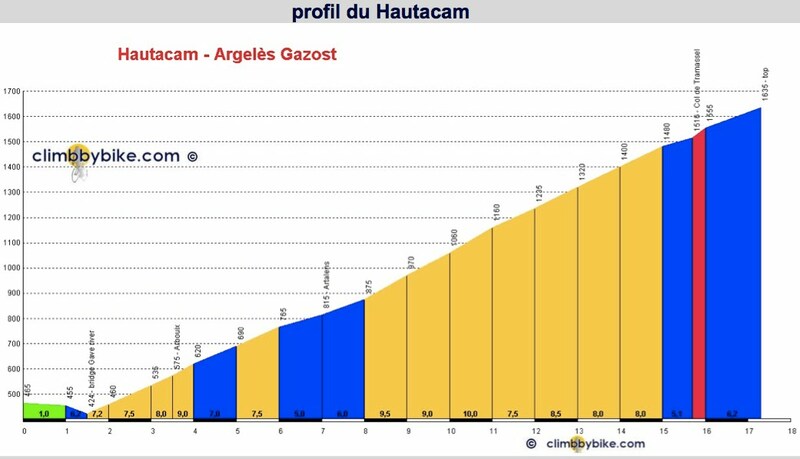 The Hautacam is a fantastic climb. If you enjoy climbing for the pure joy of climbing and are not necessarily trying to get somewhere on a bike, the Hautacam is for you. You go up the Hautacam, you come down the Hautacam. The climb up the Hautacam starts in the basin of the Lavendan Valley and winds up a beautiful green hill to the ski station. This climb is not visually laid out in front of you like so many other climbs in the area, this climb is not over until it is over. For me, over came too soon, I really enjoy this climb and did not want it to end. You start from the town of Argeles-Gazost, pass a number of homes, more fields, more cows, then the vistas begin to open up. The views to the valley below are breathtaking. The sky was dramatic today, and it began to rain near to top. I continued to the cafe (which was closed) on the Col de Tramassel (which is just above the Hautacam). Two years ago I completed the Hautacam, but had not continued to the top of the Col de Tramassel. This time warm rain was falling gently and there was no reason to stop climbing. The profile signs were in place on the Hautacam today, but nearly every white sign I passed reported the coming kilometers would again average 8%. I kept wondering why they were even bothering with the signs, simply to report that it was still 8%! Also I am convinced there were plenty of 9.9% sections in there, and maybe two 12%! This is funny because this is the second picture I took of the day - the sign at the top! The third, was the view of the green slopes from the top. I must have really been enjoying myself, because obviously I never felt like stopping. I tried to stop for pictures on the way down instead. The one road wonders, such as Hautacam and Luz Ardiden, do not offer much at the top. The cafe on the Col de Tramassel was closed. 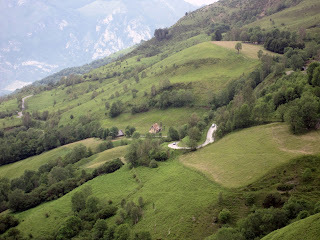 This image below is looking west across the Lavendan Valley from the Hautacam to the Col du Soulor and Col d'Aubisque. I am currently staying in the town in the middle of this picture at the left edge (Saint-Savin). Argeles-Gazost is the larger town in the middle right edge of the photo. The Hautacam is tucked against the green hillside. Now I am back in Saint Savin looking across valley to the Hautacam. The road climbs this hillside opening up to nice green (ski) slopes at the top center. When I see this last bend into the town of Saint Savin, I now I am nearing home. I celebrated with a Magnum ice cream bar (in honor of my brother Michael) back in town. And then returned to the La Lanterne Rouge cycling lodge to watch the French National Road Championship race (Thomas Voeckler won) with Paddy, Olive, and Hannah. What a great way to spend a Sunday in France. The Hautacam remains one of my favorite bike climbs in France. It may not be as dramatic as the Tourmalet, but it just feels good.